This sporty watch from August Steiner features an etched pattern dial. 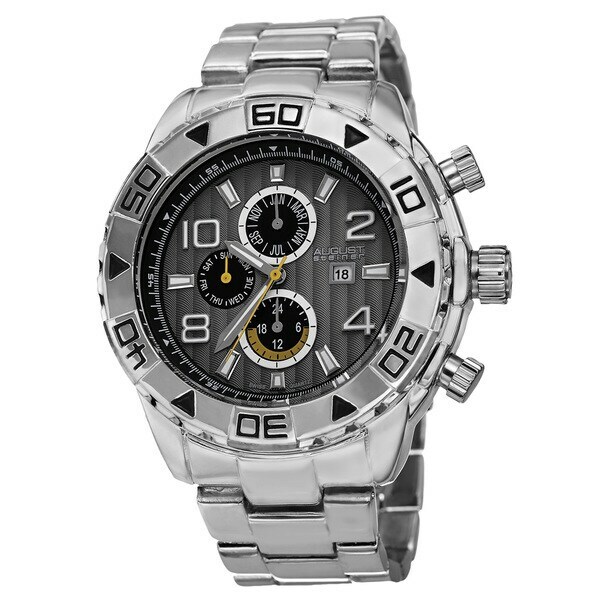 With multifunctional subdials including month, day and dual time this timepiece is an all-around winner. The Swiss quartz movement with luminous hands and markers form a sturdy watch. This is a decent watch. Looks great, it is heavy, has a nice mirror finish and wears well. It is large face (50mm) as described. This is my second one, and I am giving this a 3 star review for the simple fact as my second one filled with water while showering once as its supposed to be waterproof. Overstock took the watch back and gave me a refund, no problem. This amazingly handsome watch presents with bold features fit for a king. It is appropriate for all settings including work, church, & clubbing, Recommended for all ages but keep in mind the face is large. The stainless steel finish came off on my wrist and gave me a rash. This is the watch that they sent me in exchange for the first watch I bought where the time adjustment knobs came off. I wish there was a negative star review because they would have gotten a negative 5 stars. I will say however, that the customer service was good, probably from all of the practice they get. Terrible!! Please don't waist your money! It's worst than the cheap watches you'd buy. If you just need a simple and inexpensive watch, go to and buy one. This may've been my final straw and I'm not purchasing any more watches from overstock. This watch truly impressed me.It's very manly looking and, I've gotten quite a number of nice compliments.I really love this watch. The push buttons did not work and the owners information was nill to none. I bought as a gift. It's very heavy. Very nice. May getting one for myself. IT WAS A GIFT BUT HE SAID RE REALLY LIKED IT BUT WOULD HAVE TO GET USE TO THE WEIGHT OF IT. Very cheaply made. Rough edges, just not quality.